1 Research Unity of Valorization of Natural Resources, Bioactive Molecules and Physicochemical Biological Analysis, Department of Chemistry, Faculty of Exact Sciences, University of Mentouri- Brothers, Constantine-1, 25000, Algeria. © 2018 Mechehoud et al. We have described in this reported work a new method in the synthesis of cis-1,5-dimethyl -3-oxabicyclo [3.1.0] hexane-2,4-dione in good yield. Optimization of practical conditions leads to obtain 1,3-cyclopropanedicarboxylic anhydrides as important precursors of functionalized cyclopropane derivatives. The condensation of 2-chloropropanoic acid with ethyl methacrylate using (2M) LDA dissolved in hexane and THF at (-80°C), and the treatment with acetyl chloride permit to obtain the substituted 1,3- cyclopropanedicarboxylic anhydride . We have proceeded to the synthesis of cis-1,5-dimethyl -3-oxabicyclo [3.1.0] hexane-2,4-dione as functionalized organic compound with high efficiency ,taking into account the regioselectivity of carbanion attack to double bond activated by an electrophilic group. Using (2M) LDA dissolved in hexane and THF at (-80°C) is a good way to afford the enantioselective substituted 1,3- cyclopropanedicarboxylic anhydrides. Keywords: Cis-3-oxabicyclo, LDA, Cyclopropanedicarboxylic anhydrides, Condensation, Regioselectivity, Electrophilic. The natural cyclopropanes, generated ephemerally in primary and secondary metabolisms and the synthetic cyclopropanes, carrying simple functionalities are endowed with a large spectrum of biological properties ranging from enzyme inhibitions to antimicrobial, antiviral, antitumor and neurochemical properties , they provide convenient biological probes for mechanistic studies and allow the production of new drugs . Moreover, some synthetic derivatives such as (S) bioallethrin or bioresmethrin present a high insecticidal activity with low mammalian toxicity . The cyclopropane compounds and their derivatives have been synthesized via Michael addition taking into account their asymmetric synthesis and more particularly their stereochemistry dependence of solvent polarity .These processes are initiated by nucleophilic addition of carbanions to acrylates, followed by the 1,3-eliminative cyclization. It's about the base-catalyzed condensation of α-haloesters with α,β-unsaturated esters .The striking solvent polarity –dependence of steric orientation in their asymmetric synthesis has been elaborated by Inouye and his collaborators . Furthermore, Schmidt  suggested a mechanism involving the initial nucleophilic attack of carbanion to the polarized double bond of the Michael acceptor, followed by the probable 1,3-shift of proton in the intermediate adduct carbanion and then the intramolecular nucleophilic displacement leads to cyclopropane products. Our work has been based on the preparation of cyclopropanedicarboxylic anhydrides, which are the important precursors of various functionalized cyclopropane derivatives,, but their synthesis are not enantioselective since all derivatives are obtained in racemic forms. It is well worth noting that the cyclopropane-1,2-dicarboxylic acid occurs in three stereoisomeric configurations: The meso-cis and the (+)- and (-)- trans forms. The cis- acid whose the melting point is 139 °C (anhydride melting point is 59°C), is generated by decarboxylation of cyclopropane -1,1,2-tricarboxylic acid . However, the reaction of methyl acrylate and methyl diazoacetate, after hydrolysis permits to obtain a mixture of cis and trans –cyclopropane -1,2-dicarboxylic acid whose the melting point is 175 °C, which fails to give an anhydride on treatment with acetyl chloride . The trans-acid is obtained also from pyrolysis of the pyrazoline resulting from the addition of diazomethane to dimethyl fumarate .The cyclopropanedicarboxylic acids are inter-convertible under conditions where the cis –anhydride can be formed, it’s the case of the normal pyrolysis, where the trans is converted into the cis form. However, if anhydride formation is prevented as in the case of alkali fusion, the cis is converted into the more stable trans form . Decarboxylation of cyclopropanedicarboxylic acids has been the subject of several studies, and the data suitable to interest the forerunner researchers in the decarboxylation within acid medium have included the studies in protic medium in the presence of mineral acids, or the decarboxylation without solvent for which the carboxylic protons represent the acid medium. Whereas, the important data concerning the decarboxylation in basic medium have treated in particular the reactions in the presence of base and polar aprotic solvents. 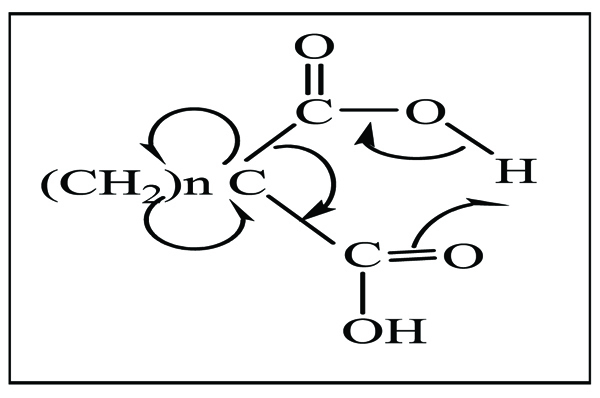 According to the Abell and Lennon’s study [11, 12], the mechanism of decarboxylation in protic acid medium, proposed for malonic acid  Scheme. (1), was revealed difficult to be transposable to cyclopropanic derivatives. Scheme (1). Decarboxylation mechanism in protic acid medium. Pr. 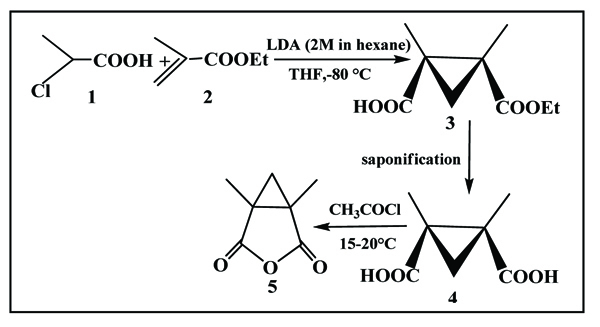 S. Benayachevia have reported that the most probable way, interpreting the different mechanisms involved in the reactions of cyclopropanic derivatives, is strongly based on the lactone formation during the decarboxylation without solvent, of several cyclopropanedicarboxylic-1,1 and tricarboxylic-1,1,2 acids. Therefore, the diacid b (Scheme. 2), was obtained from hydrolysis of the cyclic ester a, when the diacid loses the carbon dioxide by heating, and leads to formation of colored oil in which three products were separated: Stereoisomeric monoacid c in very low yield and the lactone d as the major product . Scheme (2). Decarboxylation without solvent of cyclopropane-1, 1-dicarboxylic acids. Moreover, cyclopropanic-1,1,2 acid a’ (Scheme. 3) undergoes the cleavage of propanic ring that results in the formation of 3-oxabicyclo [3.1.0] hexane-2,4-dione and the corresponding lactone: paraconic acid c’, the latter releases a molecule of water and leads to the formation of citraconic anhydride d’. Scheme (3). The cleavage of propanic ring of cyclopropanic-1,1,2 acid. The kinetic investigation of J.Bus, H. Steinberg, and Th.T de Boer has rigorously interpreted the mechanism which is related to the decarboxylation and the opening of propanic ring . Otherwise, the decarboxylation of geminal dicarboxylic acids in diluted H2SO4, H2O and aqueous NaOH, generated the corresponding γ-butyrolactone in good yield . The preparation of new enantioselective 1,5-dimethyl - 3-oxabicyclo [3.1.0] hexane-2,4-dione (compound 5) was achieved from the action of 2-chloro propionic acid (compound 1) and ethyl methacrylate (compound 2) according to the following protocol (Scheme. 4). Scheme (4). Preparation of new enantioselective 1,5-dimethyl -3-oxabicyclo [3.1.0] hexane-2,4-dione. Scheme (5). Gerard Bonavent’s method. Scheme (6). Synthesis using phosphore oxychloride reagent. Scheme (7). Synthesis using diazomethane reagent. Scheme (8). Condensation of 2-chloropropanoic acid with ethyl methacrylate. The 1H NMR spectra were recorded on Brücker DPX 400.13 MHz for proton and 100.62 MHz for 13C NMR using TMS as internal standard. The IR spectra were recorded on Perkin Elmer FT-IR spectrometer SPECTRUM 1000, on samples packaged in pellets of KBr or in the form of a deposit between two pellets of KBr (25 × 4 nm). Wavelengths were measured in cm-1. All compounds, 2-chloropropanoic acid, ethyl methacrylate, THF, LDA, CH3COCl, Hexane and EtOH as well as inorganic compounds are commercial products and used without further purification. All reactions and handling were carried out in a well-ventilated hood. Progress of the reactions and purity of the compounds were controlled by thin layer chromatography on silica gel (60 F254 Merck and 0.2 mm thick). The compounds were mainly revealed using U.V apparatus as visualizing agent, then by soaking in a KMnO4 or I2 aqueous solution, followed by heating on a hot plate. The illuminated chromatographies were carried out with silica gel (40-63 µm). Evaporation of solvents was performed at reduced pressure, using Buchi rotary evaporator. To a solution containing 66 mL LDA (2M) and THF/n-heptane at -80 °C, placed carefully a solution of 6.42 g (59 mmol, 5.43 mL) 2-chloropropanoic acid dissolved in 24 mL THF anhydride. After stirring for 30 minutes at the same temperature, 7.50 mL (6.88 g, 59 mmol, 1 eq) ethyl methacrylate was added. The mixture was left in stirring for 20 minutes at -80 °C, and was slowly heated till ambient temperature. 150 mL of aqueous citric acid (10%) was added. The mixture was extracted with ethyl acetate. The organic phase was dried by Na2SO4 and concentrated under vacuum to a dark brown oil which was subjected to Kügelrohr distillation (at 75°C, under vacuum of Edwards pomp), and obtaining an uncolored oil: 6.56 g The yield: 58.7%. To a solution containing 190 mg (1mmol) ethyl methacrylate in 0.25 mL ethanol (95%), heated at 80 °C to 85 °C, placed a solution of 0.25 mL (3.5 eq) NaOH (40%, 14.3M) dropwise. At the end of the addition, the mixture became a white flaky matter to which added 0.25 mL water and 1 mL ethanol (95%). The reaction was stirred at refluxing temperature for 12 hours and concentrated under vacuum. To the residue containing diacid and sodium phosphate, added the ethyl acetate and the reaction was stirred at refluxing temperature for a few hours. After cooling, the product was filtrated on celite paper three times, and concentrated under vacuum to light brown oil which is cyclopropanic diacid . To the 1,3-dimethyl-1,2-cyclopropanedicarboxylic acid (219 mg,1.4 mmol), added (330 mg,4.2 mmol, 0.3 mL) acetyl chloride . The reaction was left in stirring at 15-20 °C for 15 hours. The mixture was concentrated under vacuum and heated in Kügelrohr at 80°C -100°C (real temperature at the ball of apparatus. On the other hand, the one which was displayed at the dial (165 -180°C), related to the temperature at the bottom of apparatus) under vacuum of Edwards pomp. White crystals appeared at the first ball (163 mg) The yield: 54%. 13C NMR (100 MHz, CDCl3): δ 171.19(CO), δ 31.55 (C quart), δ 29.70 (CH2), δ 10.00 (CH3) . IR, υ (KBr disc): 3093, 2991, 2985, 2977, 2943, 1861 cm−1. Cyclopropane-1,2-dicarboxylic anhydrides present an efficient class of cyclopropane compounds which have found many applications in organic syntheses and afford certain values in industrial production. Electronic and steric properties of cyclopropane derivatives, especially their conformational rigidity, which makes it possible to orient the functional groups in a perfectly defined system, generating a particularly important and interesting structural motif in medicinal chemistry. 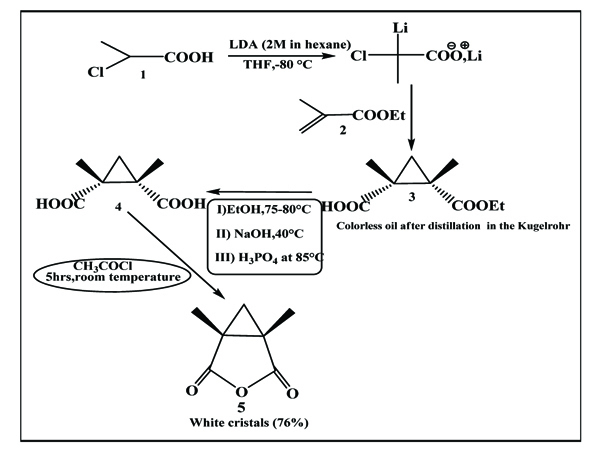 The study of cylopropanic system was mainly carried out by remarkable achievement of the related results, underlining the reactivity of the cyclopropanic-1,2 anhydride in the presence of acetyl chloride at ambient temperature and thus the use of LDA during the condensation of 2-chloropropanoic acid with ethyl methacrylate gave rise to the synthesis and made it possible to describe the 1,5-dimethyl-3-oxabicyclo[3.1.0] hexane-2,4-dione, functionalized as cis-structure. In conclusion, the simplicity of experimental procedure, the high efficiency of the corresponding reactions, as well as the regioselectivity of synthesis are the advantages of the reported protocol. We gratefully acknowledge the University of Rennes for scientific training and the University of Mentouri-Brothers-Algeria for financial support. Salaün J, Baird MS. Curr Med Chem 1995; 2: 511. Liu HW, Walsh CT. Biochemistry of the Cyclopropyl Group 1987. Chap 16; Kennewell PDbMatharu SS. J ChemSoc Perkin Trans 1982; 1: 2553.
 a) M.Eliott . Synthetic pyrethroids ,ACS .Symposium Series ,No.42: Washington DC,1977. b) M.Eliott. ; N.F.James .Chem.Soc.Rev, 1978, 7,473 . c) Imperial Chemical Industries Ltd.Brit, 1,537,449; Chem Abstr, 1979,91,51102 w.
 a) McCoy, L.L. J. Am. Chem. Soc., 1958, 80, 6568. b) McCoy, L.L. J. Am. Chem. Soc., 1962, 84, 2246. c) McCoy, L.L. J. Org. Chem., 1960, 25, 2078.Fraisse, R. Bull; Soc.Chem: France, 1959, p. 1102.
 a) Inouye, Y.; Horiike., Ms; Inouye, Y.; Inouye, Y.; Inouye, Y. J. Am. Chem. Soc., 1961, 83, 2962. b) Inouye, Y. Tetrahedron, 1968, 24, 2907. Schmidt U. R.Schröer and A.Hochrainer. Liebigs Ann 1970; 773: 180. Conrad M, Guthzeit M. On the action of α-β-dibromopropionic acid on malonic acid esters. Ber 1884; 17: 1185. 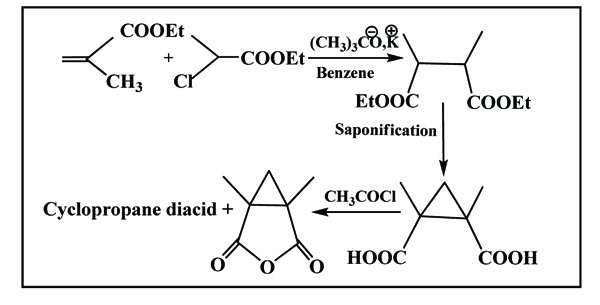 Buchner E. Influence of Diazoessigäther on the Aether Unsaturated Acids. Ber 1890; 23: 701. Pechmann HV. Pechmann HV. Ueber Diazomethan. European Journal of Inorganic Chemistry. Ber 1894; 1;27(2): 1888-91. About some polycarboxylic acids of trimethylene. Buchner, Ann 1895; 284: 197. Abell PI. Kinetics of the Decarboxylation of Some 1,1-Cycloalkanedicarboxylic Acids. J Org Chem 1965; 30: 4212. Abell PI. Stereochemistry of the Decarboxylation of Some 1,1,2-Cycloalkanetricarboxylic Acids. J Org Chem 1965; 30: 1206. Franckel G. Decarboxylation of Malonic Acid in Quinoline and Related Media. J Am Chem Soc 1954; 76: 15. Addition Reactions of Vinyl Phenyl Ketone. III. Methyl Malonate. J Am Chem Soc 1933; 55: 2953.
 de Boer Th J. The isomerisation and decarboxylation of cyclopropane-1,1-dicarboxylic acids. Tetrahedron letters 1966; 7(18): 1905.: 2048. Bonavent G, Zoller MC, Guitard M, Jullien RF. Synthesis of polyfunctional cyclopropane derivatives. Bull Soc Chim Fr 1964; 10: 2462-71. Von der Saal W, et al. Cyclopropanediamines. 3. Pure diastereomers of 1,2-cyclopropanedicarboxylic acids and derivatives. Liebigs Ann Chem 1989; 8: 703-12. Carl R. Alkylation, acylation, and cyclopropanation reactions of α-halo carboxylic acid dianions. Synthesis 1982; 4: 284-6.